On the second screen of this Twine, there is a link reading "Test vines." When you click it, that link is replaced with the text "You tug the vines. They should hold." I want to do this. I want to be able to replace and reveal text within one uninterrupted screen in a simple way. I could only find ways to do this involving variables or dice rolls, etc., and I had no idea how to take that stuff out without wrecking it. I might not have understood how to word my question when searching for it. I'm a TWINE noob, so this may not be the most elegant way to do this, but this should work. You are at a wall covered in vines. Thanks for the quick reply! I'm a total noob, too. https://i.gyazo.com/70ad3975bc65f6acfcaa9a11dd9d7404.png the page changes entirely. Unfortunately, it didn't work out on my end. Maybe I didn't get something? Ah, yeah! I think you have two passages, one called "Charlie help" and one called "The wall of vines". I did. AND, yours works perfectly too!! I'll use litrouke's for now, I think, BUT you nailed it. Happily, no need for any dice rolls or complicated stuff! I've just found out that there's a macro in Sugarcube 2.8.0 that does this, no need to even install the add-on! 1) Do you mean 2.18.0, not 2.8.0? 2) Is there a resource with examples? 2) Is there a Sugarcube 2 macro for clicking a link and making text appear under it without replacing anything (and making the link become normal text after 1 click)? Also, I seem to have trouble installing the plugin. Whenever I open Twine, the plugin disappears from my story. It saves edits I make within Twine, so I don't know why this is happening! Open the replacelink-macro-set.min.js file in a text editor (not a word processor) and copy its contents. Open the replacelink-macro-set.css file in a text editor (not a word processor) and copy its contents. Paste them into your project's stylesheet section (Twine 1: stylesheet-tagged passage, Twine 2: Story Stylesheet). Not quite. 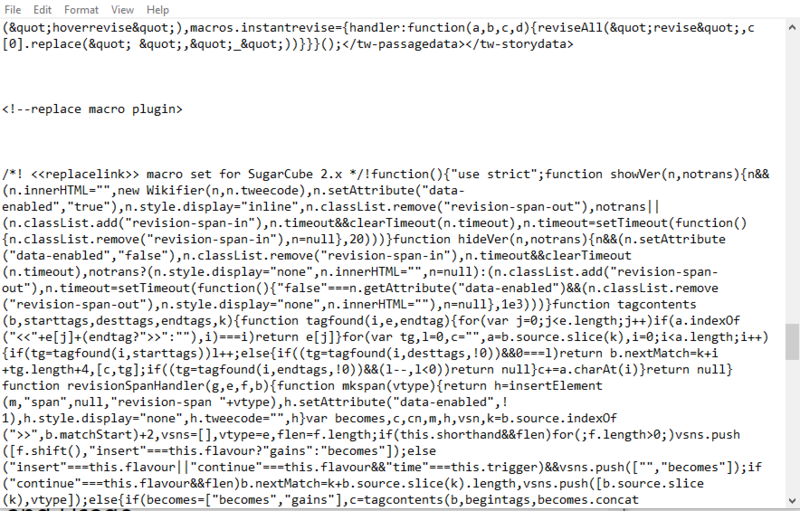 They meant that the macro was added to SugarCube as a part of v2.8.0. SugarCube's Macro Library documentation does include a few examples for each macro. They're not exhaustive, but they cover the basics. Also, reading other parts of SugarCube's documentation may prove helpful. Yes. 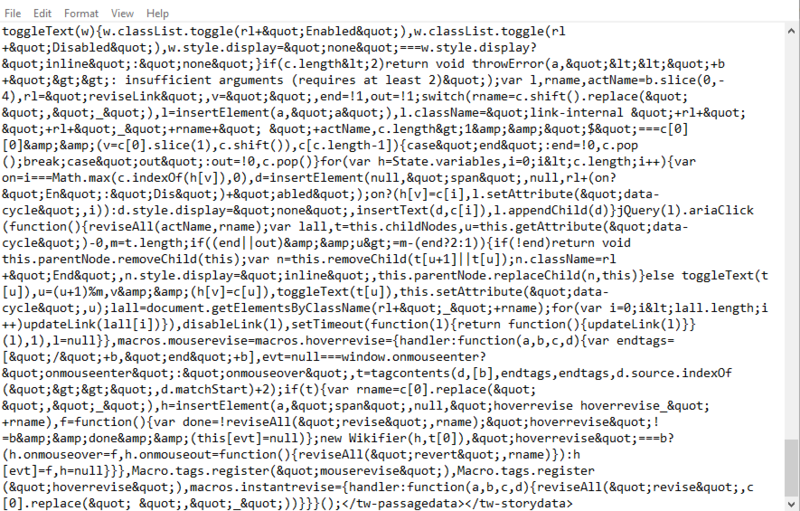 You're looking for the <<linkappend>> macro. If you want to cycle through more than a few, then you're probably better off with litrouke's answer. Is there a way to put a link replace within a link replace? I can't get it to work. Yes, though how you'd nest them depends on what you want to do. Those are simply two examples, others are possible. Additionally, you may want to look into the other <<link>> family Interactive macros and the DOM macros (see: SugarCube v2 Macro Library) as they would give you extra flexibility. 1: As noted already, you can use a Linkreplace. It's quick and easy to do. For a basic little replace, it works great. =^^= The addon replacelink, I have not used. 2: Combining a Link macro AND a Replace macro can get you the same effect, but offer up some more versatility. You likely wouldn't need it for that vine test, but for other things, this comes in VERY handy. <span></span> Spans are telling the system "hey! This piece of the page is different from the rest of it!" a span is usually used to give text special colors and features through a class (that's CSS code, i won't get into that), and ID. The ID gives the span a name that can be referred to by other pieces of code. I'll get into that with something in a minute here. basically... <span id="namethistext" class="dontworryaboutmenow"></span> Just keep in mind that spans have only single brackets, <> as opposed to a lot of other code that has two <<>>. Pushing the button results in the teleportation of bread!!! I added the variable changes just to point out that you can do more than replace text. Using this method is more complex, and certainly more than you need for just replicating the vine test, but if you want your character to remember that they checked the vines, you would probably want to use link AND replace, rather than linkreplace. Using a widget within a link to another passage ?